In Greek mythology Scylla, along with the whirlpool Charybdis, guarded both sides of the Straight of Messina between Italy and Sicily. Sailor who traversed the straight would have to choose between risking their lives with one or the other. 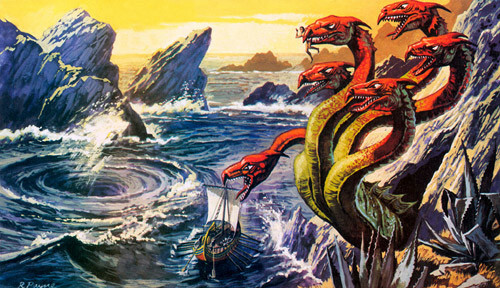 Charybdis was a whirlpool, but Scylla was a bonafide monster. According to Greek mythology Scylla had six ferocious heads, each with three rows of sharp teeth, sitting on six very long necks. Her body was made out of several growling dogs and twelve feet or tentacles (depending on who you ask). Her necks would extend out to passing ships and grab sailors, crushing them against the rocks she sat on before devouring them. Odysseus lost six of his men when passing by Scylla in The Odyssey. One for each head. Scylla wasn't always a monster though. According to certain stories in later Greek mythology Scylla was actually a beautiful sea nymph who the sea god Glaucus fell in love with. When Glaucus went to the witch Circe to ask her to cast a love spell on Scylla, Circe became jealous of his love and instead cursed the sea nymph into becoming the ferocious sea monster we now know. As a sea monster, Scylla couldn't move from her rock, so she was forever stuck on the Straight of Messina as a monster, instinctively devouring anything or anyone edible that sailed by. We don't see Scylla again for much of Greek Myth, but the impact that this creature had on Odysseus and his crew was more than enough to launch her into the list of famous mythical monsters. Return from Greek Mythology Scylla to the List of Mythical Creatures.